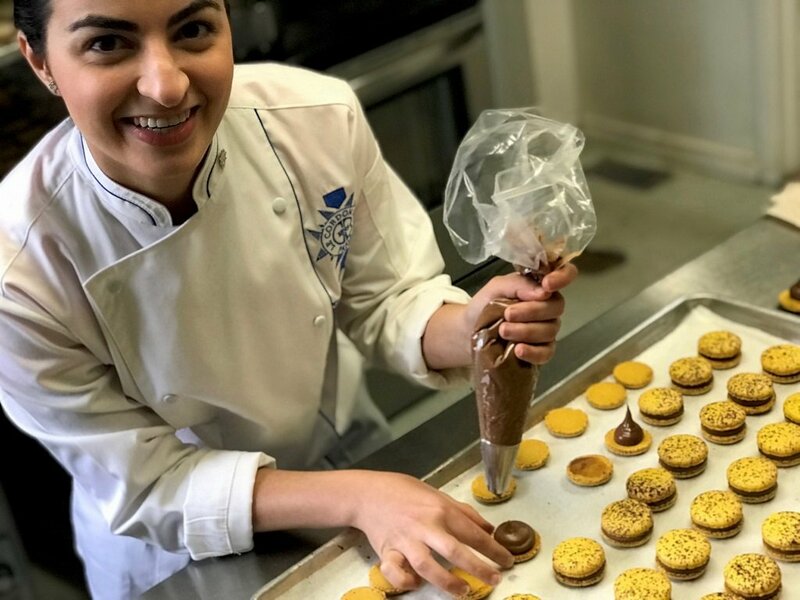 Michelle Dahdah is the Head Pastry Chef behind Quelque Chose Pâtisserie, Ottawa’s trendy macaron shop with locations in Westboro, Vanier, and soon to be the ByWard Market. We recently caught up with Michelle to find out more about her experience working in the industry and life after Le Cordon Bleu Ottawa. Michelle was born in Venezuela, she originally studied Modern Languages before deciding to follow in her sister Julia’s footsteps, who studied pastry in Paris and trained under Pierre Hermé. Michelle was inspired by her sisters’ pastries and decided to formalize her training and further pursue her education at Le Cordon Bleu Ottawa. What prompted you to decide to study the culinary arts and become a Pastry Chef?And what made you decide to choose Le Cordon Bleu in Ottawa? When I was a kid I always used to see my mom baking her signature chocolate and vanilla cakes and I loved it. Growing up she started to teach me the basics and I always loved baking something on the weekends, she always told me “you can do anything you want but clean the kitchen after” that was her only condition! 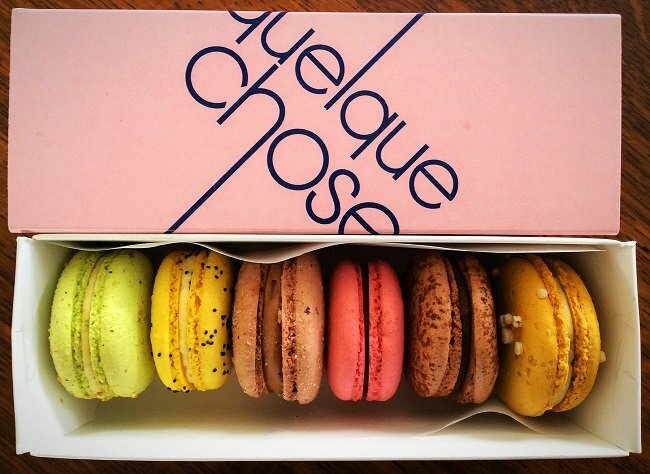 Years after, my sister Julia went to study pastry to Paris and when she went back to Venezuela her and my other sister, Susana, started what is now Quelque Chose. I started helping them part time until I graduated from university and then I got into the business full time and started to learn the art of macarons. Throughout that journey Julia taught me everything she learned in Paris and I realized that I wanted to formalize my training in pastry so I started to do some research and I fell in love with the program and the campus at Le Cordon Bleu in Ottawa. Also, my sister Julia was already living in Ottawa and had the business from home, which made me very happy because we could work together at Quelque Chose. What was one of the most important things you learned while studying and how has this made a difference to you as a Chef? I loved studying at Le Cordon Bleu, it was really one of the best experiences I’ve ever had. One of the most important things that I learnt was being organized and clean while working on a recipe, and the importance of ‘Mise en place’ in order to achieve the best results. regret for one second that decision! Nowadays, there are so many pastry chefs that are showing their amazing work through social media that it’s hard to choose just one. But if I had to choose just one it would be Pierre Hermé, because I consider him the master in macarons and he’s always creating new recipes working with amazing combinations of flavours. What’s it like being the head Chef at Quelque Chose Pâtisserie in Ottawa? It’s amazing, I love waking up every morning and going to work, each day in the kitchen there’s a different challenges to face, either fixing a split ganache or surpassing the number of macarons we made the day before. Also, I really like working with my team because everyone is good at something different and we are always learning something new from each other. What is your favorite macaron to make at the moment? I really enjoy working with shaped macarons such as a bear, Pikachu or a unicorn. The unicorn macaron has so many details and you have to be very delicate and patient doing it and somehow it relaxes me when I do it. Any pieces of advice that you would like to pass on to someone following in your footsteps? If you feel that pastry is your passion, go for it! It’s a very creative, exciting and fun world, and as I said before, Le Cordon Bleu was one of the best experiences I’ve ever had; I´d never regret for one second that decision!